The volume buttons control any external speakers you connected to the projector. You must adjust the volume separately for each connected input source. Turn on the projector and start a presentation that includes audio. 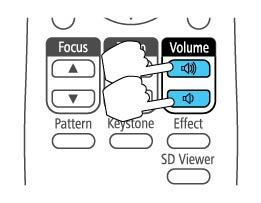 To lower or raise the volume, press the Volume buttons on the remote control. A volume gauge appears on the screen. To set the volume to a specific level for an input source, use the projector menus.